Stimulsoft Reports.Net is an application developed by Stimulsoft. We know of versions 2014.3, 2008.1, 3.9, 3.7, 3.6, 3.5, 3.1, 3.0. Version 2014.3 is available for download at our site. Stimulsoft Reports.Net installation package has a size of 12,544,219 bytes. Stimulsoft also publishes Stimulsoft Reports.Wpf and Stimulsoft Reports.Web. 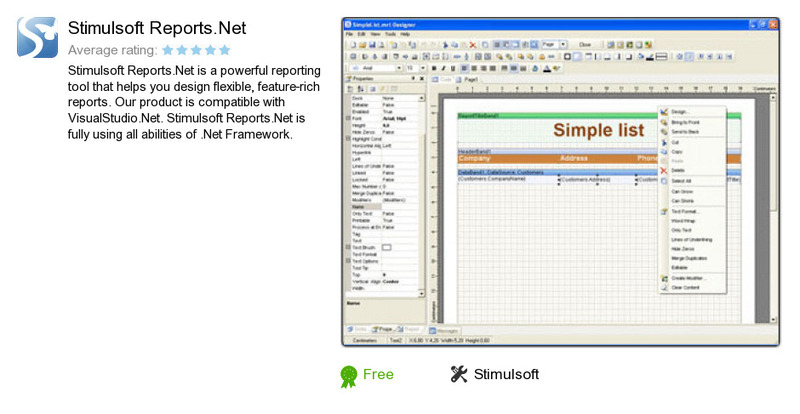 As Stimulsoft says: What is Stimulsoft Reports.Net?